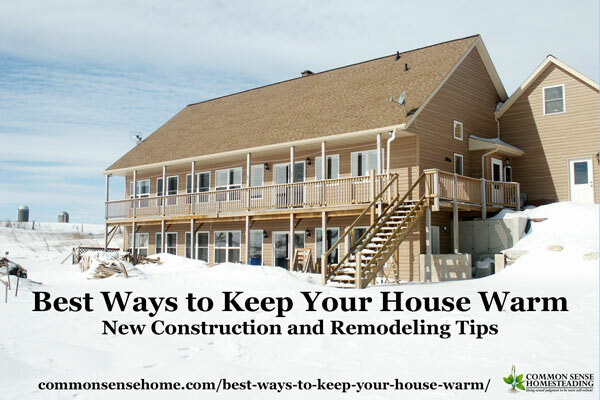 The best ways to keep your house warm in winter combine preventing heat loss and generating heat. A well built house keeps you warm in winter and cool in summer. It holds up during emergency situations like extended power outages. Money invested during building or remodeling smart will pay you back many times over in reduced heating and cooling bills. Seriously, insulate! Good house insulation matters in the winter and summer. It will pay back especially as fuel prices increase. You can do it yourself. 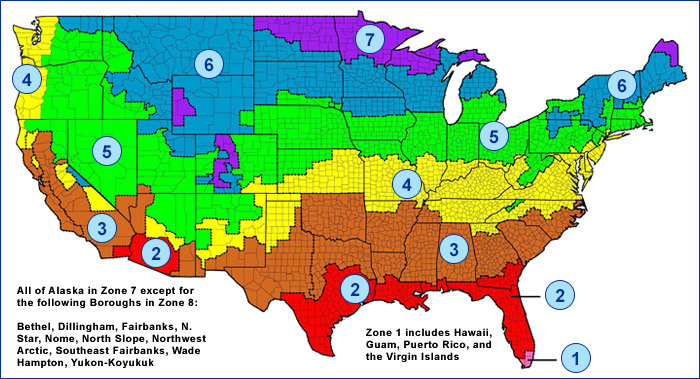 See the national map and insulate based on where you are. House insulation is key and remember, wall insulation is as important as attic insulation. If you are building a new home, make sure to insulate exterior walls. Start with 2×6 walls with high R factor roll insulation between the studs. Then add 2″ exterior rigid foam insulation. Place the exterior insulation so that the seams don't align with the seams in the OSB sheathing. If you are re-siding a home, consider adding 2 inch rigid R10 foam boards on the outside of walls under new exterior siding to improve the wall insulation (R value). You want to avoid air flow paths through the wall, so make sure outlets and any other wall penetrations are well-insulated. Select windows and doors that exceed the home insulation requirements for your normal weather. Add foam insulation in nooks and crannies during construction to reduce airflow and eliminate insulation gaps. 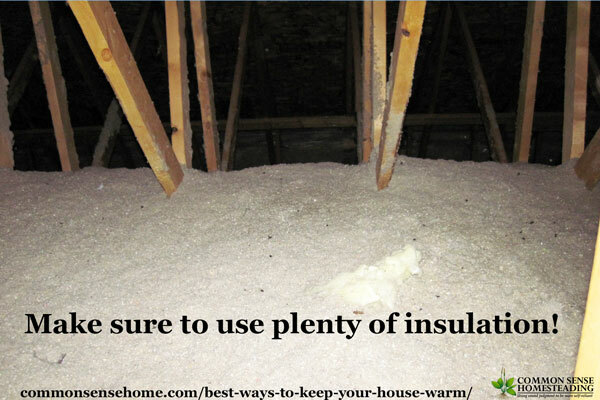 Potentially insulate interior walls if you have areas of the home that could be unoccupied during a winter emergency. Insulation can also be added to reduce noise transmission in the home. Our walls are ICF (Insulated Concrete Forms), which is concrete sandwiched in foam insulation. This creates a very good thermal mass and excellent insulation. If it's in the budget, ICF is a great home insulation option for reducing heating and cooling costs. Keep your house warm by adding mass that holds the heat. 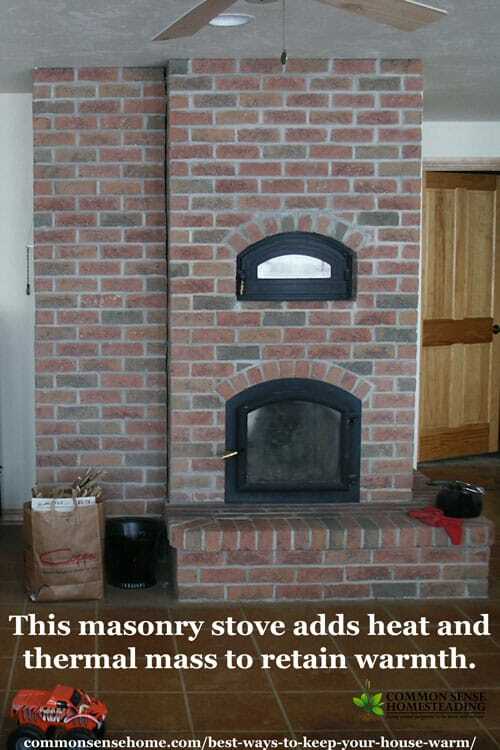 If you use wood or wood pellet heat, add a brick chimney INSIDE the envelope of the home. Place it near the center of the home if possible, so chimney heat loss radiates inside the envelope of the house. A sealed combustion fireplace or masonry stove will act as a heat reservoir in the heat of your home. Lay heavy insulation under sand, under the basement floor and along the foundation walls, with radiant tubing (hydronic tubes) to permit in floor heating. Deep heat in the basement floor really keeps the house warm. Insulation under the sand bed reduces heat loss into the soil under and around the foundation. Even if you don't insulate, make sure to put a moisture barrier under your basement slab. This will reduce mold and mildew issues in the basement. Fish tanks, big plants, heavy furniture, filled book shelves – all of these can add a small amount of thermal mass to help store heat in your home. For those building with alternative materials like cob or strawbales, building in benches or large planters can add a much larger amount of thermal mass. If possible, have more than one source for heat. The old adage, “two is one and one is none” can keep you from freezing your tail off. If once heat source fails, you can still keep warm. Mixing heating options also makes it easier to get the heat right where you need it. An Amish stove, which can provide heat, cooking, and hot water. Note: If possible provide an exterior air feed for the fireplace/stove, to reduce interior heat loss to the fireplace. If you have a wood burning fireplace or stove make sure you are closing it down appropriately and keeping the chimney clean. Consider storm windows and storm doors. Even a small gap between the exterior door and the storm door reduces heat loss (and gain). Vinyl window frames transfer less heat than metal frames, and are more durable than wood. Triple pane or argon filled windows may be appropriate for the north side of the home where you don't get winter sun and you want to minimize heat loss. Look for high r-values and tight seals, and make sure the windows and doors are properly installed. The best window on the planet won't keep out the cold if there are air leaks all around it. Consider adding a “portal” to enter and exit the home. An old fashioned enclosed porch entry allows entry without exposing the interior directly to the outside. That area also provides seasonal storage. We keep our big compost bucket in our enclosed porch, as well as winter squash and some other fruits and veggies. You can also put your attic access through the porch ceiling, so you don't lose heat inside your house to your attic. Get a generator, or if you have the money, a solar electric system. In the winter, a generator is a better bet, as the days are short and gray in the coldest of the winter. A duel fuel generator is a handy option, because they can run off of gasoline or propane. 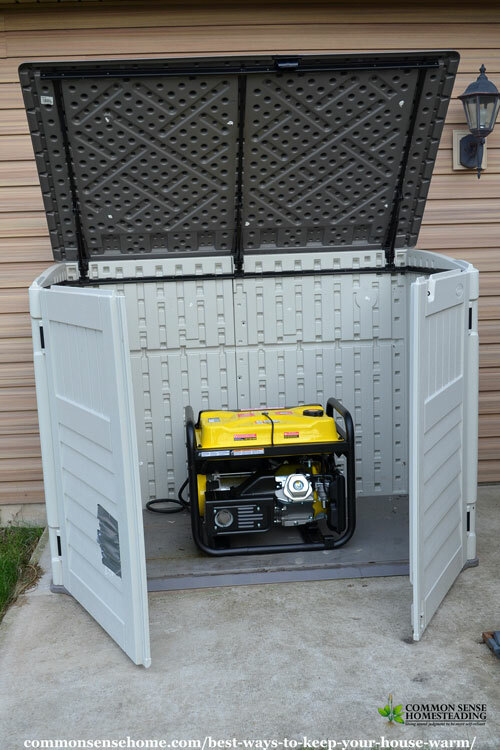 Size the generator to keep critical services running – such as electric ignitions on heating systems, blowers and pumps. See “Emergency Power Options for Your Home – Gas Generators and More” for more detailed information. Put the sun to work for you with smart placement of your home. Lay the house out so the main living area faces south. Place the majority of windows on the south side of the house, and pair them up with an overhang to keep out summer sun. Check out “Passive Solar Heating Basics – A Free Energy Way to Heat Your Home” for more info and photos of how we use passive solar heating in our home. In our home, the fresh air is routed up to the bonus room above the garage to promote circulation throughout the home. Stale air is pulled in via return vents around the home. We turn the HRV on periodically in the winter to reduce the chance of mold and freshen the house. Airflow past your home can wick heat away, so adding outside elements that reduce the wind can also help reduce your heating bill. 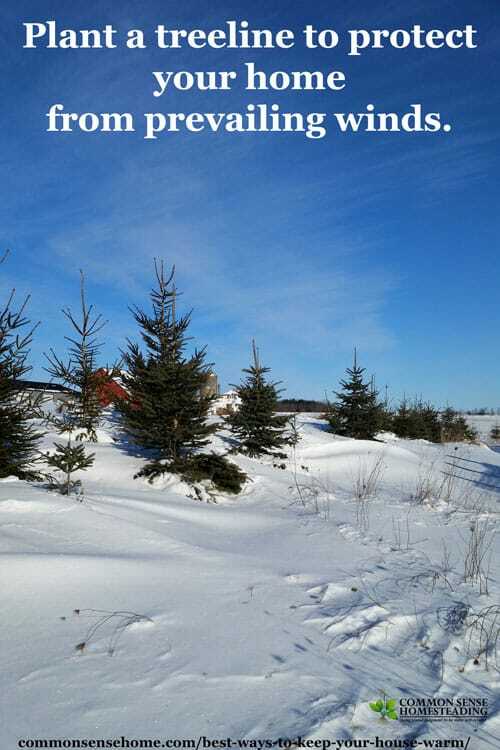 Plant a treeline to protect from prevailing winds. Organizations such as the Arbor Day Foundation and soil stewardship groups supply trees at a big discount, but quality may vary. For more info on windbreaks, see: https://lincolnconservationdistrict.com/windbreak-considerations. We recommend ColdStreamFarm. We bought most of our windbreak trees from them. The trees arrived safely and are good quality. Stark Brothers Nursery – wide variety of edible and decorative trees, plants and shrubs. If you have the space for it and don't mind the asthetics, add an earth berm the north and west sides of the home. This means building basement walls roughly 4ft higher, so earth can be up against the side of the 1st floor of the house just under the level of the first floor windows. The earth berm reduces heat loss and provides ground temperature (earth stays in the 40s so it measurably reduces heat loss on the west and north. A snow fence is a fence that is put up seasonally to control where snow drops and change drifting patterns. See the post How to Put Up a Snow Fence for more information. Even a small snow fence can break the strong winds somewhat. A permanent fence may be the best choice if you want privacy and reduced winds. If you want the winds in the summer to cool your home, a seasonal fence is a better choice. Side note on this series – August started writing one really crazy long post, which Laurie broke into several posts to hopefully make it more user friendly. 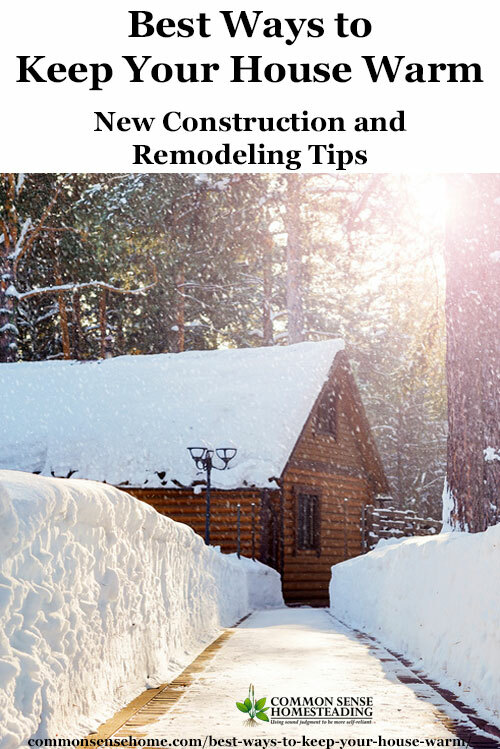 Leave a comment to share your tips or questions about building for warmth. Spent some time in Alaska as a newly married bride & the side entrance really made a difference when temps were 40 below with wind chill!! Thanks, Kathy. Our double entrance is sheltered by the garage from prevailing winds, so I didn’t think to mention this as an option. The best thing we did was spray foam insulation (polymer, not urea). We had a century home with no insulation and after we had it installed in the fall we didn’t get a gas bill all winter as the budget plan starts in August for us-we’d paid that much ahead from the previous year’s estimate. There was no odor, no drafts, and it was so much quieter in the house. We insulated the attic here and since there’s just an access panel in the hallway and we never go up there I stuffed the interior of the box with foam board, put up a square of 3M insulating plastic and hung a cabinet door just to make it look neater. It’ll come down if we need to get up there but it stopped the draft. Good insulation is a great investment for heating, cooling and noise reduction. Thanks for sharing your experience.